For locations with space limitations. The Shelf System is the perfect unit for applications with space limitations and is available in 2 – 4 ton capacities. Shelf System units are front access only. 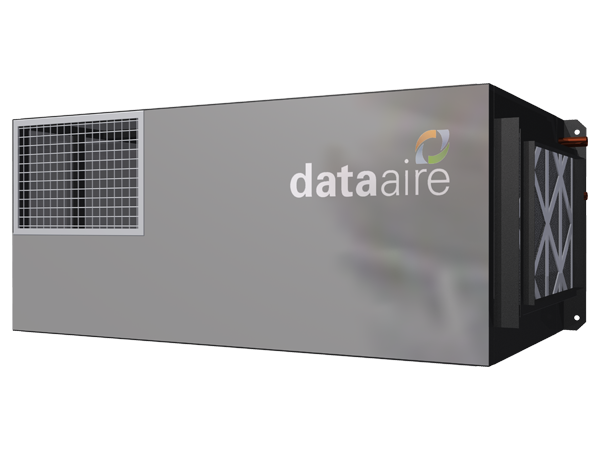 Designed for vault and shelter applications, Data Aire’s Shelf Unit offers an unsurpassed combination of features and options along with a high standard of performance. Shelf Units meet the demands of telephone and electronic equipment sites in a compact design. Engineered and built by the people who introduced computer room air conditioning, the Shelf Unit offers quality at a competitive price. Each unit comes with Data Aire’s commitment to excellence which began with our first air conditioner and has been tested and proven for more than thirty years. Shelf Units are available in 2, 3, and 4 nominal ton capacities in air cooled split systems or water cooled self-contained systems. Air cooled systems are available with either an indoor condenser or condensing unit or remote outdoor air cooled condenser or condensing unit. The Shelf Unit is not a standard unit shipped from stock. Each unit is built to the site specification and is shipped in ten working days from date of order. An optional “Quick Ship” premium program is available in order for units to ship in as little as one week. Precise temperature regulation is provided by a built-in control system. All electrical components, including capacitors, contactors, relays and control transformers are pre-wired and contained in an electrical box that is hinged and swings out for easy access and servicing. A factory installed microswitch will disable the unit prior to condensate pan overflow should the drain become plugged with debris. Units with the optional Mini Data Alarm Processor-II have a condensate pan high water level alarm standard. Units are shipped with a thermostat and sub-base. Shelf Units are constructed with tubular steel frames for strength and service access. Removable panels of galvanized steel are lined with 1/2″ thick, closed cell insulation for quiet and efficient operation. Units are designed for wall mount application. A unit mounted filter section with a 20″ x 25″ x 4″ pleated filter is provided. The evaporator section is a draw-through type with double width, double inlet blower with belt drive and variable pitch sheave. The self-aligning ball bearings are rated for a minimum life of 100,000 hours. The evaporator coil is constructed of copper tubes and aluminum fins. The expansion valve with external equalization is contained in the evaporator section. A stainless steel drain pan is standard. The condensing unit contains a scroll compressor with crankcase heater, filter drier, sight glass, and condenser coil. The condenser coil is constructed with copper tubes and aluminum fins. The condenser blower is double inlet, double width with belt drive and variable pitch sheave. Field piping and wiring is required between the indoor evaporator and condensing unit sections. The evaporator section is a draw through type with double width, double inlet blower with belt drive and variable pitch sheave. The self-aligning ball bearings are rated for a minimum life of 100,000 hours. The evaporator coil is constructed of copper tubes and aluminum fins. The expansion valve with external equalization is contained in the evaporator section. A stainless steel drain pan is standard. The condensing section includes a scroll compressor with crankcase heater, filter drier and sight glass. The condenser section includes a condenser coil and condenser blower. The condenser coil is constructed of copper tubes and aluminum fins. The blower is double inlet, double width with belt drive and variable pitch sheave. Field piping and wiring is required between the indoor evaporator/compressor and the condenser sections. The evaporator section is a draw-through type with double width, double blower with belt drive and variable pitch sheave. The self-aligning ball bearings are rated for a minimum life of 100,000 hours. The evaporator coil is constructed of copper tubes and aluminum fins. The single stage refrigeration circuit includes an expansion valve with external equalization. A stainless steel drain pan is standard. The condensing unit contains a scroll compressor with crankcase heater, filter drier, sight glass, and condenser coil. The condenser coil is constructed with copper tubes and aluminum fins. The galvanized steel housing and fan guard powder coated for longer life. Air discharge is vertical. The condenser fan is variable speed for head pressure control to -20° F ambient conditions. Field piping and wiring is required between the indoor evaporator section and the outdoor condensing unit. The evaporator section is a draw through type with double width, double inlet blower with belt drive and variable pitch sheave. The self-aligning ball bearings are rated for a minimum life of 100,000 hours. The evaporator coil is constructed of copper tubes and aluminum fins. The expansion valve with external equalization is contained in the evaporator section. A stainless steel drain pan is standard. The compressor section includes a scroll compressor with crankcase heater, filter drier and sight glass. The outdoor condenser includes a condenser coil, integral factory wired panel and condenser fan motor. The condenser coil is constructed of copper tubes and aluminum fins. The thermally protected fan motor is variable speed for head pressure control to -20° F ambient conditions. The galvanized steel housing is powder coated for longer life. Field piping and wiring is required between the indoor evaporator/compressor section and the outdoor condenser. Self-contained. The cabinet houses the evaporator section, evaporator blower assembly, and filter section. The evaporator coil contained in each unit is constructed with copper tubes and aluminum fins mounted in a stainless steel drain pan. The single refrigeration circuit includes a scroll compressor with internal protection and crankcase heater. The circuit includes an expansion valve with external equalizer, filter drier, sight-glass, and high and low pressure safety switches. In addition, a high efficiency plate-fin condenser with head pressure activated 2-way water regulating valve is built into the refrigeration system and is contained in the evaporator section. The blower assembly is a draw-through type with a centrifugal, forward curved, double width, double inlet blower configuration engineered for quiet, reliable operation. The belt driven variable pitch drive provides adjustable air flow capability to match the requirements of the controlled space. The draw-through design insures even air distribution across the coil, low internal cabinet losses, and static sealing of the filter section. The motor has internal overload protection and is mounted on an adjustable slide base. Note: A fluid cooler or water cooling source is required. The blower section contains a double width, double inlet blower with belt drive and a variable pitch sheave and blower motor. The self-aligning ball bearings are rated for a minimum life of 100,000 hours. The chilled water coil and chilled water valve are housed in the blower section as well. The chilled water coil is constructed of copper tube and aluminum fins. Utilizing chilled water from an existing chilled water loop, water flow is controlled by a 2-way valve for accurate and economical temperature control and dehumidification. The drain pan is constructed from stainless steel. Temperature and humidity, with the minimum and maximum readings since the last power on can be recalled and displayed. Alarm history is maintained in sequential order (last 5 alarms). Automatic and manual diagnostics simplify troubleshooting. In addition, the Mini Data Alarm Processor-II has an inclusive seven day programming format for unoccupied or low demand periods. This secondary schedule can minimize equipment runtimes, reducing energy consumption and provide user cost savings. * Alarm displays require additional components or sensors and programmable selections. Some alarm messages are selected in three optional alarm menus. The Mini Data Alarm Processor-II is a wall mounted, one row, 16 character control that not only monitors the controlled environment’s humidity, air flow, and cleanliness, but also provides alarm history and an automatic self-test of the microprocessor on system start-up. Multiple messages are displayed by automatically scrolling from each message to the next. All messages are presented in a clear vernacular format on the liquid crystal display (LCD). Multiple alarms are displayed sequentially in order of occurrence. OPERATION: A slide switch allows unit on/off operation. Push buttons allow menu selection for programming, operational information, diagnostics, and historical data. The two-level password feature prevents unauthorized access. Menu programmed information for basic system operation and alarm parameters is non-volatile. STEAM GENERATOR HUMIDIFIER: An electric steam generator humidifier with disposable cylinder and self-regulating auto flush is available. Units with steam generator humidifier require the Mini Data Alarm Processor-II . A five pound per hour humidifier may be added on all units (2.5 – 5 tons). A 10 pound per hour humidifier is also available on the 4 and 5 ton size units. The 10 pound per hour humidifier can also be ordered with modulating control. Modulation feature allows the humidifier to match its output to the signal from the humidity control. HOT WATER REHEAT: Where hot water is available, a water coil for reheat may be ordered. coil is designed for 150 psi maximum water pressure and includes a 2-way valve. Units with hot water reheat do not include electric reheat. HOT GAS REHEAT: The unit’s hot gas discharge may be used for reheat and maximum system efficiency. Electric reheat is eliminated. NOTE: Hot gas reheat option is not available with all configurations (consult factory on unit availability) or Energy Saver option. The next size motor selection is recommended. DISCONNECT SWITCH: A unit mounted disconnect switch with 1/4 turn latch may be added. The switch must be in the “OFF” position to remove panel and access electrical compartment. SEPARATE POWER SOURCE: Indoor split systems may be ordered with separate power feeds. A power connection is provided for both the evaporator section and/or condenser/condensing unit. HOT GAS BYPASS: Hot gas bypass is available for either packaged or split systems. Hot gas bypass control on the refrigerant circuit will maintain minimum suction pressure during low load conditions. UNIT MOUNTED RECEIVER: Unit mounted receiver in compressor section with pressure control and liquid line solenoid valve. Receiver allows unit to operate down to -30&3176; F/34.4° C. NOTE: Only available on units with remote outdoor condenser sections. REMOTE RECEIVER: Insulated receiver with head pressure control valve. Liquid line solenoid valves are included. NOTE: Consult with factory on runs exceeding 50 feet. 3-WAY WATER REGULATING VALVE: A 3-way pressure control valve replaces the standard 2-way valve. 3-WAY CHILLED WATER: A 3-way chilled water valve replaces the standard 2-way valve. CONDENSATE PUMP: Ships loose for field installation. Available in 115 or 230 volt. Power source is required. Pump body can be placed within the unit coil pan. Pump has maximum of 8 feet head. HIGH EFFICIENCY FILTERS: 60% efficient filters (ASHRAE Std. 52-76) are available to replace standard 30% rated filters. Extended compressor warranties are available for periods of twenty-four (24) or forty-two (42) months in addition to the standard factory eighteen (18) month warranty. These warranties are for the replacement of compressors and do not include labor. The Shelf System is designed to be wall-mounted which only requires service access through the front of the unit. Units may be ordered with either an indoor or remote outdoor condenser or condensing unit. Both water-cooled and chilled water-type shelf systems are also available.